Thomas Cullen earned an Hon. B.Sc. in Geology and an M.Sc. in Vertebrate Palaeontology from Carleton University in his home town of Ottawa. Tom examined vertebrate microfossils from the Foremost Formation of Alberta during his BSc., based on material collected as part of the Southern Alberta Dinosaur Project, and analyzed an ornithomimid bone bed for his undergrad thesis. His M.Sc thesis studied the evolution of sexual dimorphism in seals, and he conducted fieldwork in the high arctic. For his Ph.D research, Tom is using stable isotope geochemistry to investigate Late Cretaceous community paleoecology, and is assessing distributions in the Belly River Group as a case study for assessing the relationship between dinosaur faunal turnover and paleoclimate change. Cullen, T.M., F. Fanti, M. J. Ryan, C. Capobianco, and D. C. Evans. (In press). A vertebrate microsite spanning the marine-terrestrial transition in the Foremost Formation of Alberta, Canada, and the use of faunal assemblage data in palaeoenvironmental interpretations. Palaeogeography, Palaeoclimatology, Palaeoecology. Cullen, T. M., D. C. Evans, M. J. Ryan, P. J. Currie and Y. Kobayashi. 2014. Osteohistological variation in growth marks and osteocyte lacunar density in a theropod dinosaur (Coelurosauria: Ornithomimidae). BMC Evolutionary Biology 14(1):231. Available here. Cullen, TM., Fraser, D., Rybczynski, N., and Schroder-Adams, C. 2014. Early evolution of sexual dimorphism and polygyny in Pinnipedia. Evolution (Early Online) DOI: 10.1111/evo.12360 Press release here. Cullen, TM., Ryan, MJ., Currie, PJ., Kobayashi, Y., and Evans, DC. Multi-element histological analysis of an ornithomimid (Dinosauria: Theropoda) bonebed from the late cretaceous of Alberta, with implications for skeletochronology in theropods. Second International Symposium on Paleohistology, July 18-20, 2013. Cullen, TM., Fraser, D., Rybczynski, N., and Schröder-Adams, C. Early evolution of sexual dimorphism and polygyny within Pinnipedia. 23rd Canadian Paleontology Conference. Aug.29-Sept.1, 2013. Cullen, TM., Ryan, MJ., Capobianco, C., Newbrey, M., and Evans, DC. A vertebrate microfossil site with a terrestrial-dominated faunal assemblage from the upper Foremost Formation (Campanian) of Alberta. Journal of Vertebrate Paleontology, SVP Program and Abstracts Book, 2013. Cullen, T., Pugh, A., Schröder-Adams, C., Halfkenny, B., Rybczynski, N., and Mitchell, T. Geoheritage Sites of the Canadian Arctic: Increasing Awareness through Education and Co-operation. International Polar Year Conference 2012. Cullen, T., Ryan, M., Evans, D, Currie, P, and Kobayashi, Y. Preliminary results of a multi-element histological analysis of an ornithomimid (Dinosauria) bone bed from the late Cretaceous of Alberta. Geological Association of Canada – Mineralogical Association of Canada Meeting 2012. Cullen, T., Rybczynski, N. and Schröder-Adams, C. A female Enaliarctos emlongi (Carnivora, Pinnipedimorpha) from the Miocene of western Oregon and the evolution of sexual dimorphism within Pinnipedia. 1st Joint Congress on Evolutionary Biology. July 6-10, 2012. Cullen, TM., Ryan, MJ., Evans, DC., Capobianco, C., and Newbrey, M. Taxonomy and palaeoecology of a vertebrate microsite from the Foremost Formation of southern Alberta, Canada. 22nd Canadian Paleontology Conference. Sept. 21-23, 2012. Cullen, T., Ryan, M., Schröder-Adams, C., Kobayashi, Y., and Currie, P. Multi-element histological analysis of an ornithomimid (Dinosauria) bone bed from the Horseshoe Canyon Formation, Alberta. Journal of Vertebrate Paleontology, SVP Program and Abstracts Book, 2012. Cullen, T., Rybczynski, N. and Schröder-Adams, C. 2011. Preliminary description of a female Enaliarctos emlongi (Carnivora: Pinnipedia) from the Miocene of western Oregon and implications for the evolution of pinniped mating systems. Canadian Society of Zoologists annual meeting. Ottawa, ON. Cullen, T., Rybczynski, N., and Schröder-Adams, C. Description of a small skull specimen of Enaliarctos (Carnivora, Pinnipedimorpha) from the Miocene of western Oregon. Journal of Vertebrate Paleontology, SVP Program and Abstracts Book, 2011. Cullen, T., Ryan, M., Schröder-Adams, C., Kobayashi, Y., Currie, P. Description of the first ornithomimid (Dinosauria) bonebed from North America with implications for the discrimination, ontogeny and behavior of ornithomimids. Journal of Vertebrate Paleontology, SVP Program and Abstracts Book, 2010, 77A. 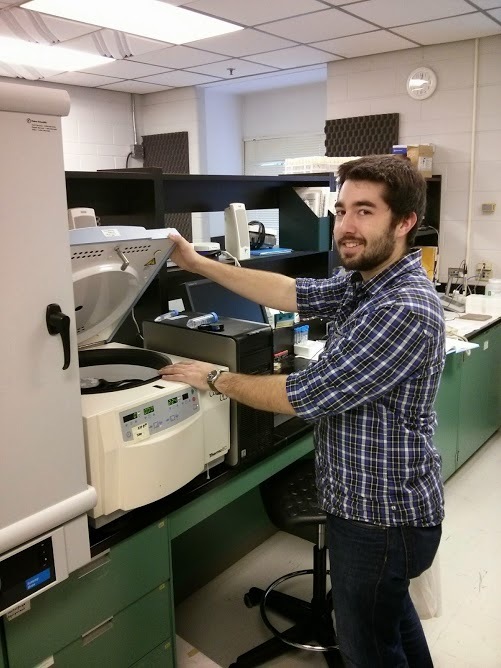 Tom processing fossil microsite samples for isotopic analysis in the U of T Geology Department.